Neural networks, in particular recurrent neural networks (RNNs), are now at the core of the leading approaches to language understanding tasks such as language modeling, machine translation and question answering. In Attention Is All You Need we introduce the Transformer, a novel neural network architecture based on a self-attention mechanism that we believe to be particularly well-suited for language understanding. 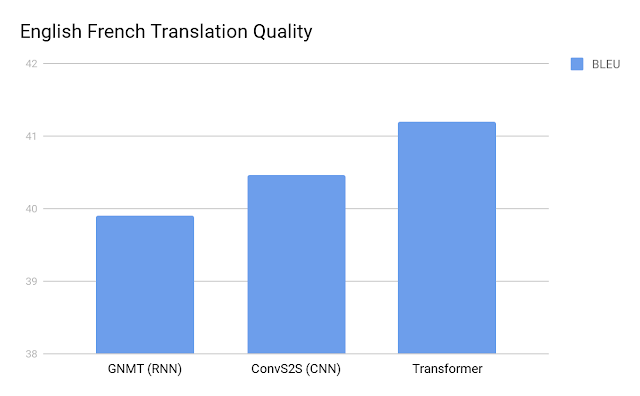 In our paper, we show that the Transformer outperforms both recurrent and convolutional models on academic English to German and English to French translation benchmarks. On top of higher translation quality, the Transformer requires less computation to train and is a much better fit for modern machine learning hardware, speeding up training by up to an order of magnitude. BLEU scores (higher is better) of single models on the standard WMT newstest2014 English to German translation benchmark. BLEU scores (higher is better) of single models on the standard WMT newstest2014 English to French translation benchmark. RNNs have in recent years become the typical network architecture for translation, processing language sequentially in a left-to-right or right-to-left fashion. Reading one word at a time, this forces RNNs to perform multiple steps to make decisions that depend on words far away from each other. Processing the example above, an RNN could only determine that “bank” is likely to refer to the bank of a river after reading each word between “bank” and “river” step by step. Prior research has shown that, roughly speaking, the more such steps decisions require, the harder it is for a recurrent network to learn how to make those decisions. The sequential nature of RNNs also makes it more difficult to fully take advantage of modern fast computing devices such as TPUs and GPUs, which excel at parallel and not sequential processing. 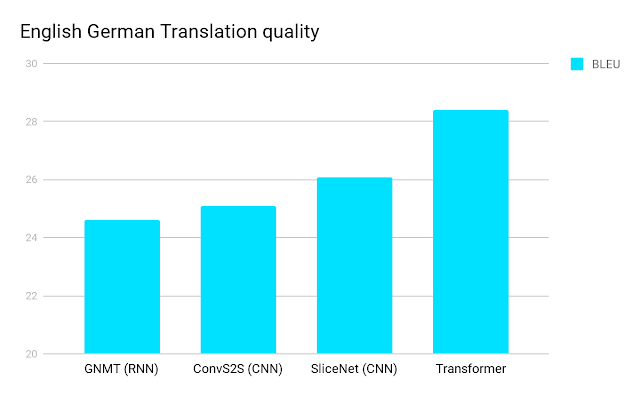 Convolutional neural networks (CNNs) are much less sequential than RNNs, but in CNN architectures like ByteNet or ConvS2S the number of steps required to combine information from distant parts of the input still grows with increasing distance. In contrast, the Transformer only performs a small, constant number of steps (chosen empirically). In each step, it applies a self-attention mechanism which directly models relationships between all words in a sentence, regardless of their respective position. In the earlier example “I arrived at the bank after crossing the river”, to determine that the word “bank” refers to the shore of a river and not a financial institution, the Transformer can learn to immediately attend to the word “river” and make this decision in a single step. In fact, in our English-French translation model we observe exactly this behavior. More specifically, to compute the next representation for a given word - “bank” for example - the Transformer compares it to every other word in the sentence. The result of these comparisons is an attention score for every other word in the sentence. These attention scores determine how much each of the other words should contribute to the next representation of “bank”. In the example, the disambiguating “river” could receive a high attention score when computing a new representation for “bank”. The attention scores are then used as weights for a weighted average of all words’ representations which is fed into a fully-connected network to generate a new representation for “bank”, reflecting that the sentence is talking about a river bank. The animation below illustrates how we apply the Transformer to machine translation. Neural networks for machine translation typically contain an encoder reading the input sentence and generating a representation of it. A decoder then generates the output sentence word by word while consulting the representation generated by the encoder. The Transformer starts by generating initial representations, or embeddings, for each word. These are represented by the unfilled circles. Then, using self-attention, it aggregates information from all of the other words, generating a new representation per word informed by the entire context, represented by the filled balls. This step is then repeated multiple times in parallel for all words, successively generating new representations. The decoder operates similarly, but generates one word at a time, from left to right. It attends not only to the other previously generated words, but also to the final representations generated by the encoder. Beyond computational performance and higher accuracy, another intriguing aspect of the Transformer is that we can visualize what other parts of a sentence the network attends to when processing or translating a given word, thus gaining insights into how information travels through the network. It is obvious to most that in the first sentence pair “it” refers to the animal, and in the second to the street. When translating these sentences to French or German, the translation for “it” depends on the gender of the noun it refers to - and in French “animal” and “street” have different genders. In contrast to the current Google Translate model, the Transformer translates both of these sentences to French correctly. Visualizing what words the encoder attended to when computing the final representation for the word “it” sheds some light on how the network made the decision. In one of its steps, the Transformer clearly identified the two nouns “it” could refer to and the respective amount of attention reflects its choice in the different contexts. The encoder self-attention distribution for the word “it” from the 5th to the 6th layer of a Transformer trained on English to French translation (one of eight attention heads). Given this insight, it might not be that surprising that the Transformer also performs very well on the classic language analysis task of syntactic constituency parsing, a task the natural language processing community has attacked with highly specialized systems for decades. In fact, with little adaptation, the same network we used for English to German translation outperformed all but one of the previously proposed approaches to constituency parsing. We are very excited about the future potential of the Transformer and have already started applying it to other problems involving not only natural language but also very different inputs and outputs, such as images and video. Our ongoing experiments are accelerated immensely by the Tensor2Tensor library, which we recently open sourced. In fact, after downloading the library you can train your own Transformer networks for translation and parsing by invoking just a few commands. We hope you’ll give it a try, and look forward to seeing what the community can do with the Transformer. This research was conducted by Ashish Vaswani, Noam Shazeer, Niki Parmar, Jakob Uszkoreit, Llion Jones, Aidan N. Gomez, Łukasz Kaiser and Illia Polosukhin. Additional thanks go to David Chenell for creating the animation above. Machine learning systems are increasingly influencing many aspects of everyday life, and are used by both the hardware and software products that serve people globally. As such, researchers and designers seeking to create products that are useful and accessible for everyone often face the challenge of finding data sets that reflect the variety and backgrounds of users around the world. In order to train these machine learning systems, open, global — and growing — datasets are needed. Over the last six months, we’ve seen such a dataset emerge from users of Quick, Draw!, Google’s latest approach to helping wide, international audiences understand how neural networks work. A group of Googlers designed Quick, Draw! as a way for anyone to interact with a machine learning system in a fun way, drawing everyday objects like trees and mugs. The system will try to guess what their drawing depicts, within 20 seconds. While the goal of Quick, Draw! 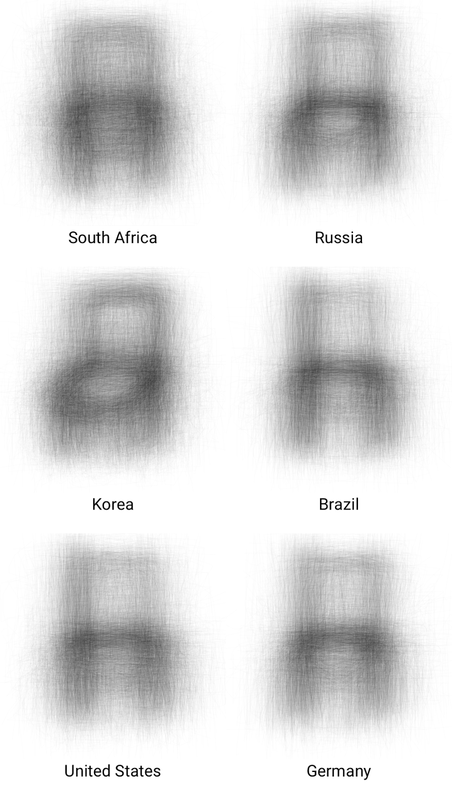 was simply to create a fun game that runs on machine learning, it has resulted in 800 million drawings from twenty million people in 100 nations, from Brazil to Japan to the U.S. to South Africa. 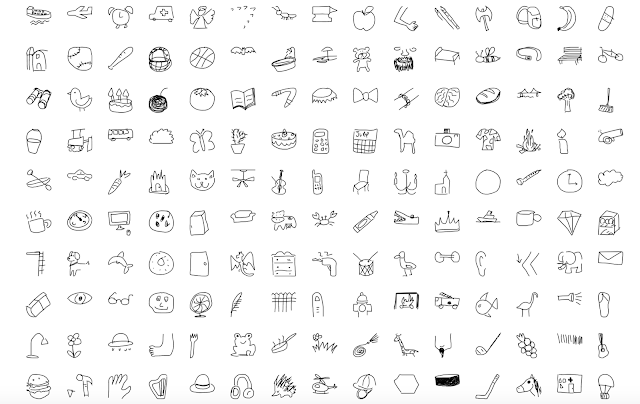 And now we are releasing an open dataset based on these drawings so that people around the world can contribute to, analyze, and inform product design with this data. 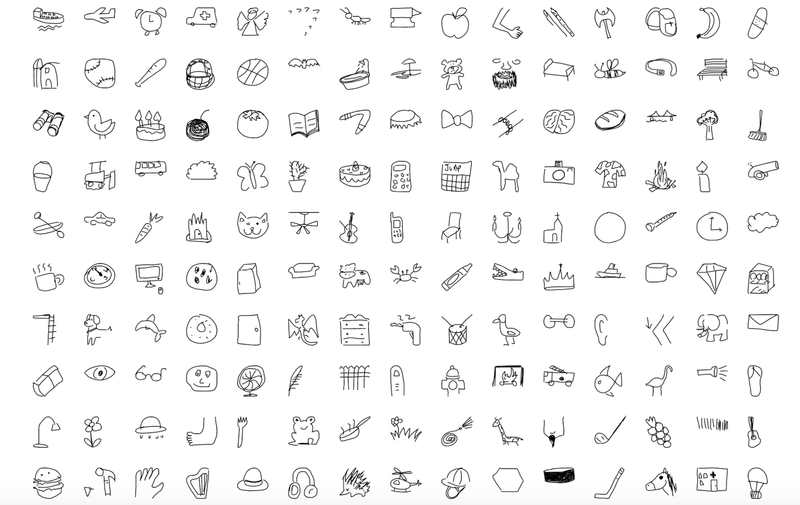 The dataset currently includes 50 million drawings Quick Draw! 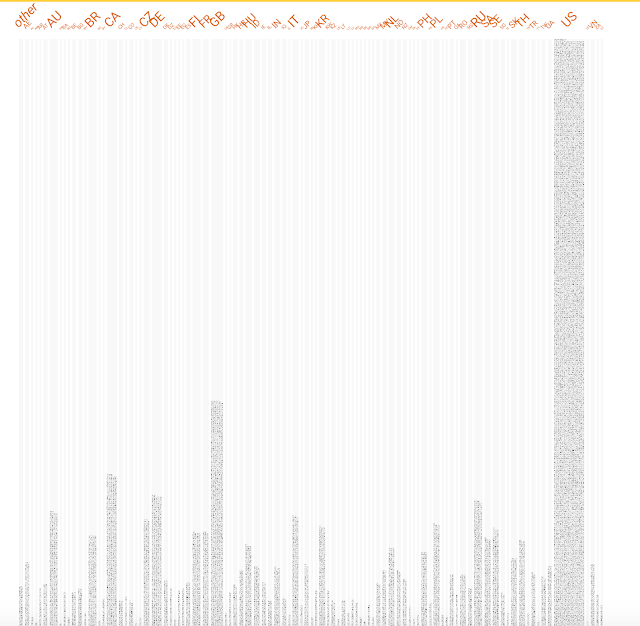 players have generated (we will continue to release more of the 800 million drawings over time). It’s a considerable amount of data; and it’s also a fascinating lens into how to engage a wide variety of people to participate in (1) training machine learning systems, no matter what their technical background; and (2) the creation of open data sets that reflect a wide spectrum of cultures and points of view. These composite drawings, we realized, could reveal how perspectives and preferences differ between audiences from different regions, from the type of bread used in sandwiches to the shape of a coffee cup, to the aesthetic of how to depict objects so they are visually appealing. For example, a more straightforward, head-on view was more consistent in some nations; side angles in others. But just as in the physical world, in the realm of training data, one size does not fit all. We asked, how can we consistently and efficiently analyze datasets for clues that could point toward latent bias? And what would happen if a team built a classifier based on a non-varied set of data? With the open source tool Facets, released last month as part of Google’s PAIR initiative, one can see patterns across a large dataset quickly. The goal is to efficiently, and visually, diagnose how representative large datasets, like the Quick, Draw! Dataset, may be. Here’s a screenshot from the Quick,Draw! dataset within the Facets tool. The tool helped us position thousands of drawings by "faceting" them in multiple dimensions by their feature values, such as country, up to 100 countries. You, too, can filter for for features such as “random faces” in a 10-country view, which can then be expanded to 100 countries. At a glance, you can see proportions of country representations. You can also zoom in and see details of each individual drawing, allowing you to dive deeper into single data points. This is especially helpful when working with a large visual data set like Quick, Draw!, allowing researchers to explore for subtle differences or anomalies, or to begin flagging small-scale visual trends that might emerge later as patterns within the larger data set. Here’s the same Quick, Draw! 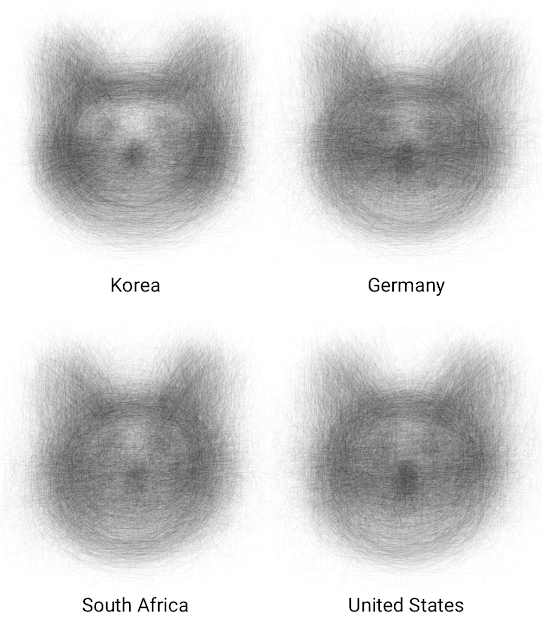 data for “random faces,” faceted for 94 countries and seen from another view. 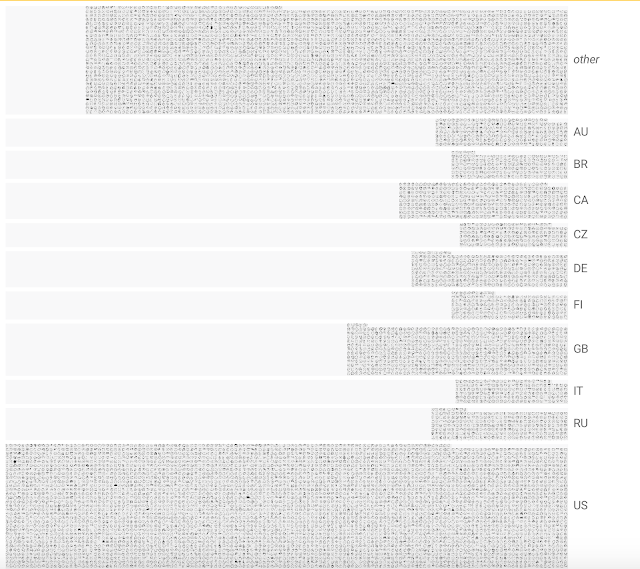 It’s clear in the few seconds that Facets loads the drawings in this new visualization that the data is overwhelmingly representative of the United States and European countries. This is logical given that the Quick, Draw! game is currently only available in English. We plan to add more languages over time. However, the visualization shows us that Brazil and Thailand seem to be non-English-speaking nations that are relatively well-represented within the data. This suggested to us that designers could potentially research what elements of the interface design may have worked well in these countries. Then, we could use that information to improve Quick,Draw! in its next iteration for other global, non-English-speaking audiences. We’re also using the faceted data to help us figure out how prioritize local languages for future translations. By releasing this dataset, and tools like Facets, we hope to facilitate the exploration of more inclusive approaches to machine learning, and to turn those observations into opportunities for innovation. We’re just beginning to draw insights from both Quick, Draw! and Facets. And we invite you to draw more with us, too. Jonas Jongejan, Henry Rowley, Takashi Kawashima, Jongmin Kim, Nick Fox-Gieg, built Quick, Draw! in collaboration with Google Creative Lab and Google’s Data Arts Team. The video about fairness in machine learning was created by Teo Soares, Alexander Chen, Bridget Prophet, Lisa Steinman, and JR Schmidt from Google Creative Lab. James Wexler, Jimbo Wilson, and Mahima Pushkarna, of PAIR, designed Facets, a project led by Martin Wattenberg and Fernanda Viégas, Senior Staff Research Scientists on the Google Brain team, and UX Researcher Jess Holbrook. Ian Johnson from the Google Cloud team contributed to the visualizations of overlaid drawings. At Google, we’re often asked how to get started using deep learning for speech and other audio recognition problems, like detecting keywords or commands. And while there are some great open source speech recognition systems like Kaldi that can use neural networks as a component, their sophistication makes them tough to use as a guide to a simpler tasks. Perhaps more importantly, there aren’t many free and openly available datasets ready to be used for a beginner’s tutorial (many require preprocessing before a neural network model can be built on them) or that are well suited for simple keyword detection. To solve these problems, the TensorFlow and AIY teams have created the Speech Commands Dataset, and used it to add training* and inference sample code to TensorFlow. The dataset has 65,000 one-second long utterances of 30 short words, by thousands of different people, contributed by members of the public through the AIY website. It’s released under a Creative Commons BY 4.0 license, and will continue to grow in future releases as more contributions are received. The dataset is designed to let you build basic but useful voice interfaces for applications, with common words like “Yes”, “No”, digits, and directions included. The infrastructure we used to create the data has been open sourced too, and we hope to see it used by the wider community to create their own versions, especially to cover underserved languages and applications. 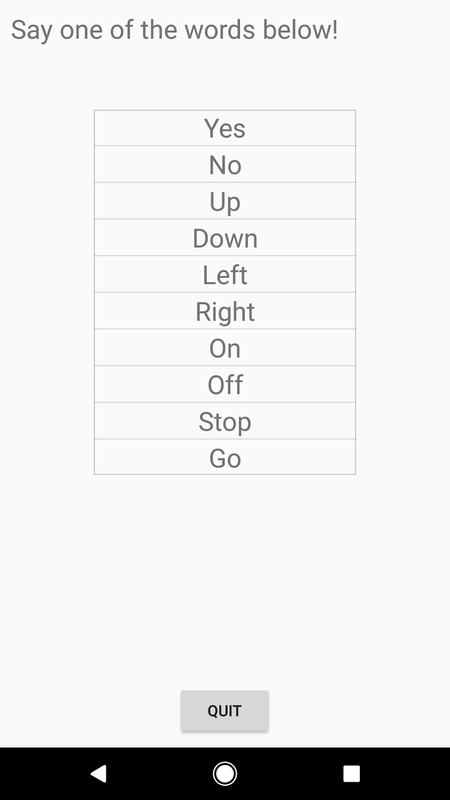 To try it out for yourself, download the prebuilt set of the TensorFlow Android demo applications and open up “TF Speech”. You’ll be asked for permission to access your microphone, and then see a list of ten words, each of which should light up as you say them. The results will depend on whether your speech patterns are covered by the dataset, so it may not be perfect — commercial speech recognition systems are a lot more complex than this teaching example. But we’re hoping that as more accents and variations are added to the dataset, and as the community contributes improved models to TensorFlow, we’ll continue to see improvements and extensions. You can also learn how to train your own version of this model through the new audio recognition tutorial on TensorFlow.org. With the latest development version of the framework and a modern desktop machine, you can download the dataset and train the model in just a few hours. You’ll also see a wide variety of options to customize the neural network for different problems, and to make different latency, size, and accuracy tradeoffs to run on different platforms. We are excited to see what new applications people are able to build with the help of this dataset and tutorial, so I hope you get a chance to dive in and start recognizing! The 23rd ACM conference on Knowledge Discovery and Data Mining (KDD’17), a main venue for academic and industry research in data science, information retrieval, data mining and machine learning, was held last week in Halifax, Canada. Google has historically been an active participant in KDD, and this year was no exception, with Googlers’ contributing numerous papers and participating in workshops. In addition to our overall participation, we are happy to congratulate fellow Googler Bryan Perozzi for receiving the SIGKDD 2017 Doctoral Dissertation Award, which serves to recognize excellent research by doctoral candidates in the field of data mining and knowledge discovery. This award was given in recognition of his thesis on the topic of machine learning on graphs performed at Stony Brook University, under the advisorship of Steven Skiena. Part of his thesis was developed during his internships at Google. The thesis dealt with using a restricted set of local graph primitives (such as ego-networks and truncated random walks) to effectively exploit the information around each vertex for classification, clustering, and anomaly detection. Most notably, the work introduced the random-walk paradigm for graph embedding with neural networks in DeepWalk. DeepWalk: Online Learning of Social Representations, originally presented at KDD'14, outlines a method for using a series of local information obtained from truncated random walks to learn latent representations of nodes in a graph (e.g. users in a social network). The core idea was to treat each segment of a random walk as a sentence “in the language of the graph.” These segments could then be used as input for neural network models to learn representations of the graph’s nodes, using sequence modeling methods like word2vec (which had just been developed at the time). This research continues at Google, most recently with Learning Edge Representations via Low-Rank Asymmetric Projections. The full list of Google contributions at KDD’17 is listed below (Googlers highlighted in blue). Doctoral Dissertation Award: Bryan Perozzi, for Local Modeling of Attributed Graphs: Algorithms and Applications. Doctoral Dissertation Runner-up Award: Alex Beutel, for User Behavior Modeling with Large-Scale Graph Analysis. New York City is home to several Google algorithms research groups. We collaborate closely with the teams behind many Google products and work on a wide variety of algorithmic challenges, like optimizing infrastructure, protecting privacy, improving friend suggestions and much more. Today, we’re excited to provide more insights into the research done in the Big Apple with the launch of the NYC Algorithms and Optimization Team page. The NYC Algorithms and Optimization Team comprises multiple overlapping research groups working on large-scale graph mining, large-scale optimization and market algorithms. 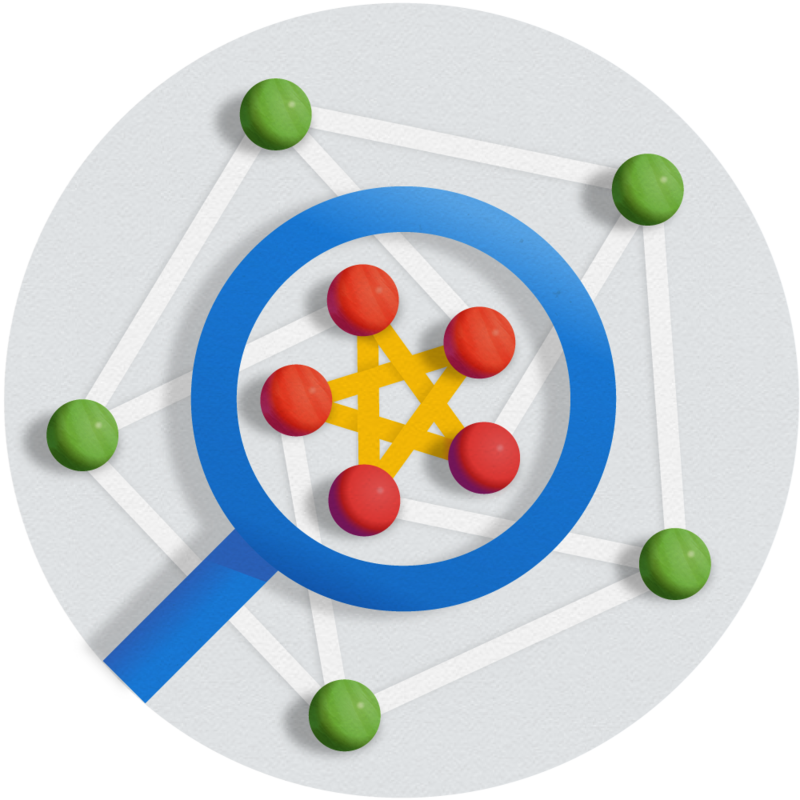 The Large-scale Graph Mining Group is tasked with building the most scalable library for graph algorithms and analysis and applying it to a multitude of Google products. We formalize data mining and machine learning challenges as graph algorithms problems and perform fundamental research in those fields leading to publications in top venues. Large-scale Similarity Ranking: Our research in pairwise similarity ranking has produced a number of innovative methods, which we have published in top venues such as WWW, ICML, and VLDB, e.g., improving friend suggestion using ego-networks and computing similarity rankings in large-scale multi-categorical bipartite graphs. Balanced Partitioning: Balanced partitioning is often a crucial first step in solving large-scale graph optimization problems. As our paper shows, we are able to achieve a 15-25% reduction in cut size compared to state-of-the-art algorithms in the literature. Clustering and Connected Components: We have state-of-the-art implementations of many different algorithms including hierarchical clustering, overlapping clustering, local clustering, spectral clustering, and connected components. Our methods are 10-30x faster than the best previously studied algorithms and can scale to graphs with trillions of edges. Public-private Graph Computation: Our research on novel models of graph computation based on a personal view of private data preserves the privacy of each user. 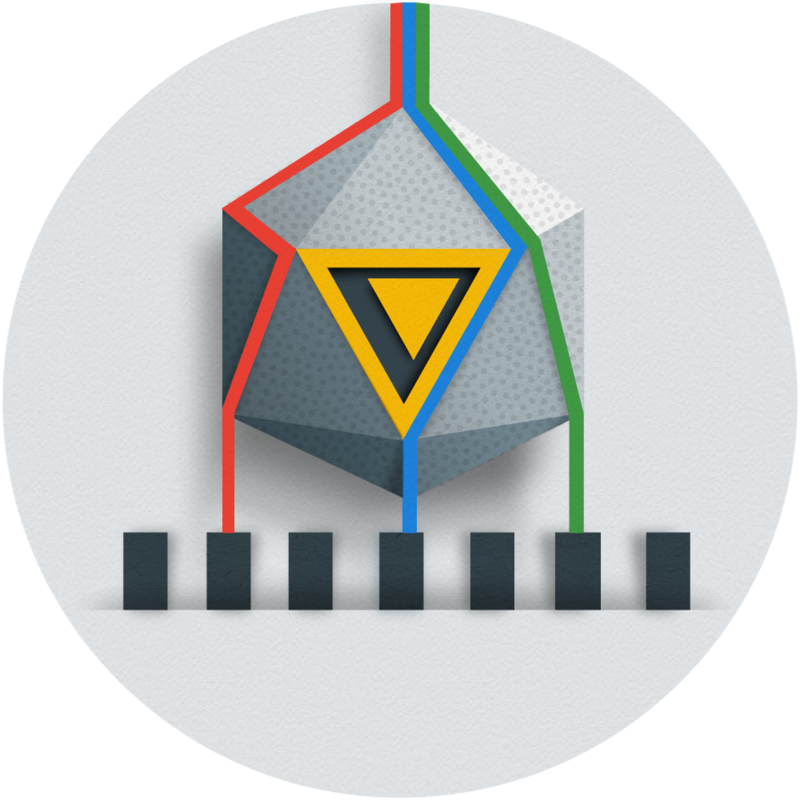 The Large-scale Optimization Group’s mission is to develop large-scale optimization techniques and use them to improve the efficiency and robustness of infrastructure at Google. We apply techniques from areas such as combinatorial optimization, online algorithms, and control theory to make Google’s massive computational infrastructure do more with less. We combine online and offline optimizations to achieve such goals as increasing throughput, decreasing latency, minimizing resource contention, maximizing the efficacy of caches, and eliminating unnecessary work in distributed systems. Consistent Hashing: We designed memoryless balanced allocation algorithms to assign a dynamic set of clients to a dynamic set of servers such that the load on each server is bounded, and the allocation does not change by much for every update operation. This technique is currently implemented in Google Cloud Pub/Sub and externally in the open-source haproxy. Distributed Optimization Based on Core-sets: Composable core-sets provide an effective method for solving optimization problems on massive datasets. This technique can be used for several problems including distributed balanced clustering and distributed submodular maximization. 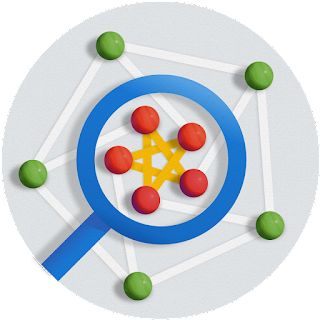 Google Search Infrastructure Optimization: We partnered with the Google Search infrastructure team to build a distributed feedback control loop to govern the way queries are fanned out to machines. We also improved the efficacy of caching by increasing the homogeneity of the stream of queries seen by any single machine. 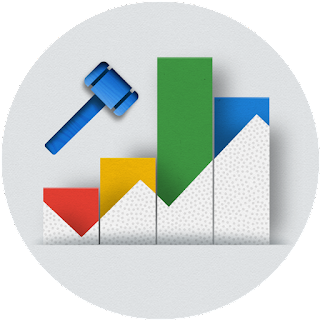 The Market Algorithms Group analyzes, designs, and delivers economically and computationally efficient marketplaces across Google. Our research serves to optimize display ads for DoubleClick’s reservation ads and exchange, as well as sponsored search and mobile ads. Display Ads Research: The Display ads ecosystem provides a great platform for a variety of research problems in online stochastic optimization and computational economics, such as whole-page optimization and optimal contract design. An important part of this research area is dedicated to auction optimization for advertising exchanges where we deal with auctions with intermediaries, optimal pricing strategies, and optimal yield management for reservation contracts and ad exchanges. Online Stochastic Matching: We have developed new algorithms for online stochastic matching, budgeted allocation, handling traffic spikes, and more general variants of the problem, called submodular welfare maximization. Robust Stochastic Allocation: In one paper, we study online algorithms that achieve a good performance in both adversarial and stochastic arrival models. In another paper, we develop a hybrid model and algorithms with approximation factors that change as a function of the accuracy of the forecast. Optimizing Advertiser Campaigns: We have studied algorithmic questions such as positive carryover effects, budget optimization in search-based auctions, and concise bid optimization strategies with multiple budget constraints. Dynamic Mechanism Design: We have developed efficient mechanisms for sophisticated settings that occur in internet advertising, such as online settings and polyhedral constraints. We have also designed a new family of dynamic mechanisms, called bank account mechanisms, and showed their effectiveness in designing non-clairvoyant dynamic mechanisms that can be implemented without relying on forecasting the future steps. For a summary of our research activities, you can take a look at talks at our recent market algorithms workshop. It is our hope that with the help of this new Google NYC Algorithms and Optimization Team page that we can more effectively share our work and broaden our dialogue with the research and engineering community. Please visit the site to learn about our latest projects, publications, seminars, and research areas! Whether you are a photographer, a marketing manager, or a regular Internet user, chances are you have encountered visible watermarks many times. Visible watermarks are those logos and patterns that are often overlaid on digital images provided by stock photography websites, marking the image owners while allowing viewers to perceive the underlying content so that they could license the images that fit their needs. It is the most common mechanism for protecting the copyrights of hundreds of millions of photographs and stock images that are offered online daily. It’s standard practice to use watermarks on the assumption that they prevent consumers from accessing the clean images, ensuring there will be no unauthorized or unlicensed use. However, in “On The Effectiveness Of Visible Watermarks” recently presented at the 2017 Computer Vision and Pattern Recognition Conference (CVPR 2017), we show that a computer algorithm can get past this protection and remove watermarks automatically, giving users unobstructed access to the clean images the watermarks are intended to protect. 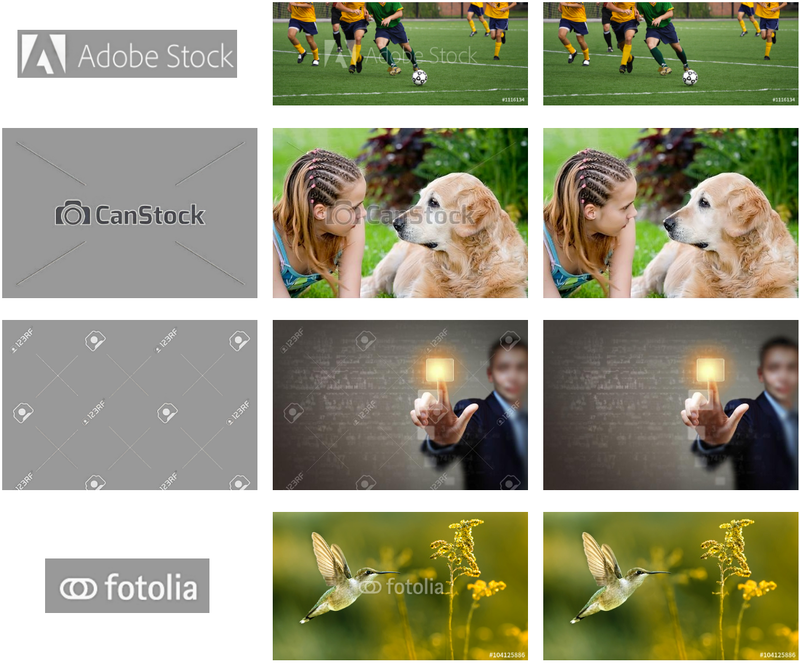 Left: example watermarked images from popular stock photography websites. Right: watermark-free version of the images on the left, produced automatically by a computer algorithm. More results are available below and on our project page. Image sources: Adobe Stock, 123RF. As often done with vulnerabilities discovered in operating systems, applications or protocols, we want to disclose this vulnerability and propose solutions in order to help the photography and stock image communities adapt and better protect its copyrighted content and creations. From our experiments much of the world’s stock imagery is currently susceptible to this circumvention. As such, in our paper we also propose ways to make visible watermarks more robust to such manipulations. Visible watermarks are often designed to contain complex structures such as thin lines and shadows in order to make them harder to remove. Indeed, given a single image, for a computer to detect automatically which visual structures belong to the watermark and which structures belong to the underlying image is extremely difficult. Manually, the task of removing a watermark from an image is tedious, and even with state-of-the-art editing tools it may take a Photoshop expert several minutes to remove a watermark from one image. However, a fact that has been overlooked so far is that watermarks are typically added in a consistent manner to many images. We show that this consistency can be used to invert the watermarking process — that is, estimate the watermark image and its opacity, and recover the original, watermark-free image underneath. This can all be done automatically, without any user intervention or prior information about the watermark, and by only observing watermarked image collections publicly available online. The consistency of a watermark over many images allows to automatically remove it in mass scale. Left: input collection marked by the same watermark, middle: computed watermark and its opacity, right: recovered, watermark-free images. Image sources: COCO dataset, Copyright logo. The first step of this process is identifying which image structures are repeating in the collection. If a similar watermark is embedded in many images, the watermark becomes the signal in the collection and the images become the noise, and simple image operations can be used to pull out a rough estimation of the watermark pattern. Watermark extraction with increasing number of images. Left: watermarked input images, Middle: median intensities over the input images (up to the input image shown), Right: the corresponding estimated (matted) watermark. All images licensed from 123RF. This provides a rough (noisy) estimate of the matted watermark (the watermark image times its spatially varying opacity, i.e., alpha matte). To actually recover the image underneath the watermark, we need to know the watermark’s decomposition into its image and alpha matte components. For this, a multi-image optimization problem can be formed, which we call “multi-image matting” (an extension of the traditional, single image matting problem), where the watermark (“foreground”) is separated into its image and opacity components while reconstructing a subset of clean (“background”) images. This optimization is able to produce very accurate estimations of the watermark components already from hundreds of images, and can deal with most watermarks used in practice, including ones containing thin structures, shadows or color gradients (as long as the watermarks are semi-transparent). Once the watermark pattern is recovered, it can be efficiently removed from any image marked by it. 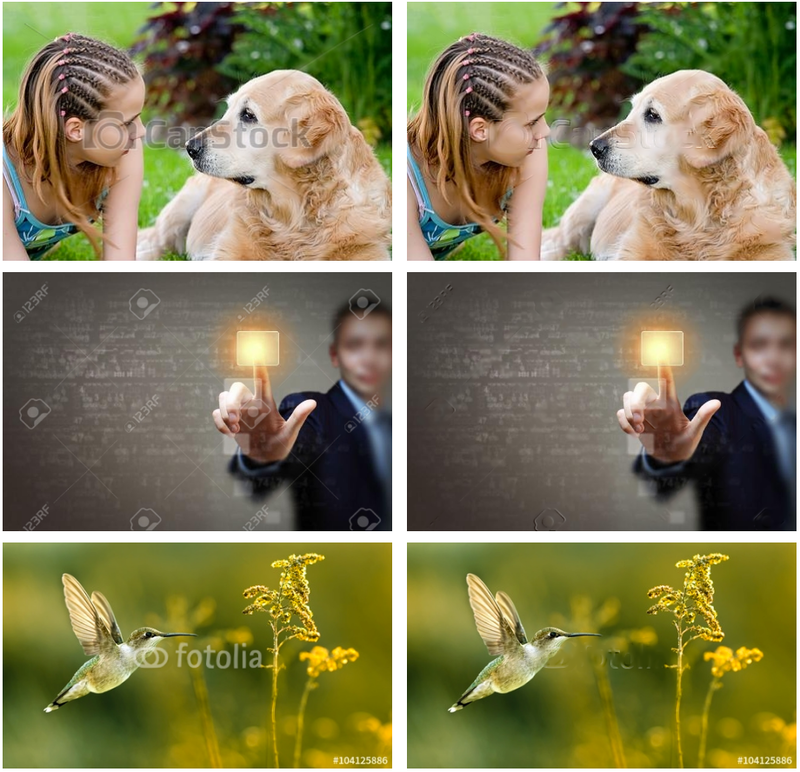 Here are some more results, showing the estimated watermarks and example watermark-free results generated for several popular stock image services. We show many more results in our supplementary material on the project page. Left column: Watermark estimated automatically from watermarked images online (rendered on a gray background). Middle colum: Input watermarked image. 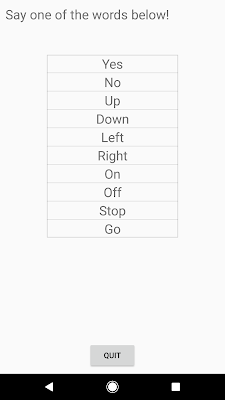 Right column: Automatically removed watermark. Image sources: Adobe Stock, Can Stock Photo, 123RF, Fotolia. The vulnerability of current watermarking techniques lies in the consistency in watermarks across image collections. Therefore, to counter it, we need to introduce inconsistencies when embedding the watermark in each image. In our paper we looked at several types of inconsistencies and how they affect the techniques described above. We found for example that simply changing the watermark’s position randomly per image does not prevent removing the watermark, nor do small random changes in the watermark’s opacity. But we found that introducing random geometric perturbations to the watermark — warping it when embedding it in each image — improves its robustness. Interestingly, very subtle warping is already enough to generate watermarks that this technique cannot fully defeat. In a nutshell, the reason this works is because removing the randomly-warped watermark from any single image requires to additionally estimate the warp field that was applied to the watermark for that image — a task that is inherently more difficult. Therefore, even if the watermark pattern can be estimated in the presence of these random perturbations (which by itself is nontrivial), accurately removing it without any visible artifact is far more challenging. Here are some more results on the images from above when using subtle, randomly warped versions of the watermarks. Notice again how visible artifacts remain when trying to remove the watermark in this case, compared to the accurate reconstructions that are achievable with current, consistent watermarks. More results and a detailed analysis can be found in our paper and project page. Left column: Watermarked image, using subtle, random warping of the watermark. Right Column: Watermark removal result. This subtle random warping is only one type of randomization that can be introduced to make watermarks more effective. A nice feature of that solution is that it is simple to implement and already improves the robustness of the watermark to image-collection attacks while at the same time being mostly imperceptible. 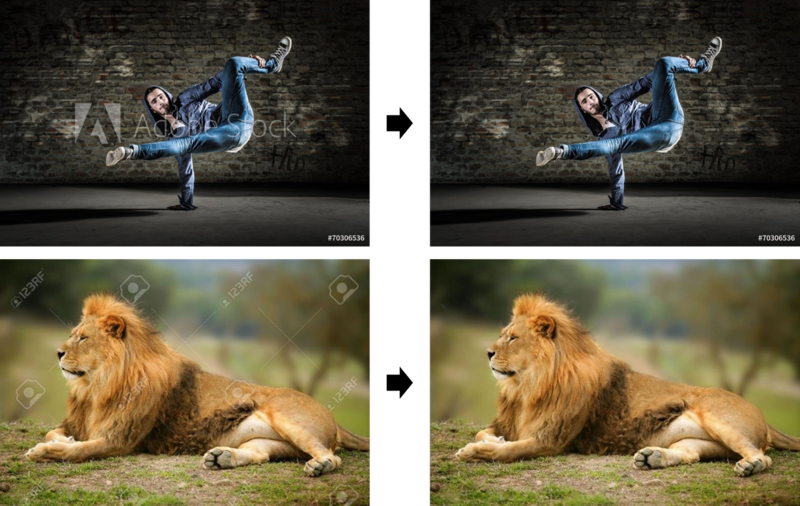 If more visible changes to the watermark across the images are acceptable — for example, introducing larger shifts in the watermark or incorporating other random elements in it — they may lead to an even better protection. While we cannot guarantee that there will not be a way to break such randomized watermarking schemes in the future, we believe (and our experiments show) that randomization will make watermarked collection attacks fundamentally more difficult. We hope that these findings will be helpful for the photography and stock image communities. The research described in this post was performed by Tali Dekel, Michael Rubinstein, Ce Liu and Bill Freeman. We thank Aaron Maschinot for narrating our video. If you're attending ICML 2017, we hope you'll visit the Google booth and talk with our researchers to learn more about the exciting work, creativity and fun that goes into solving some of the field's most interesting challenges. Our researchers will also be available to talk about and demo several recent efforts, including the technology behind Facets, neural audio synthesis with Nsynth, a Q&A session on the Google Brain Residency program and much more. You can also learn more about our research being presented at ICML 2017 in the list below (Googlers highlighted in blue).